Pierre Routhier, of Digital Troublemaker, challenges our widespread devotion to HDR. 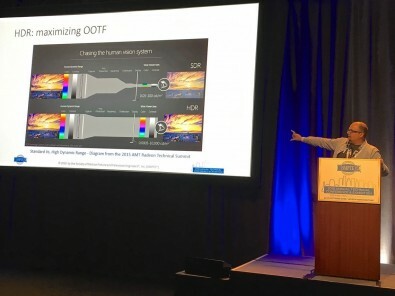 At Tuesday’s 10:30 AM session in the Sacramento Room during SMPTE 2018, former aerospace engineer and famed author, Pierre Hugues Routhier, Eng., M.Eng., challenged us to re-think our un-critical devotion to HDR, calling it the “high beam effect”-the peak brightness that can blind the viewer to important story lines hidden in the darkness. He even said HDR is not the ideal imagery for all situations, and he had some data to prove it. 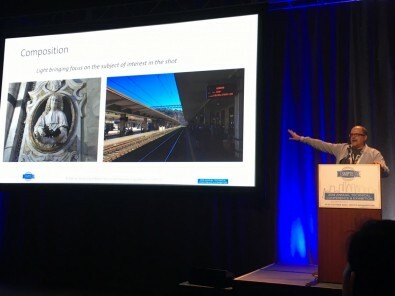 The session was officially called “What are the ‘killer apps’ for HDR?”, but Routhier’s presentation covered a wide field. “For once, engineers have the chance to work with the creatives to have input on the experience they are desiring to create,” he began. “It has to do with the OOTF (Opto-Optical Transfer Function) which is the idea of minimizing the photons from what is in front of the camera to what is in front of our eyes. Surprisingly, that can be advantageous, or it can be detrimental to our experience. What the camera sees is not what the eye sees, said Routhier. Click to enlarge. We know about Latitude-brightness to dark, or the contrast range. But Routhier contends that is not enough for HDR. Richness adds to the distribution of pixels, but that is also not enough. In one of these images, the sun is hitting the scene just right. Which to you think is better? Finally, there is composition which this image illustrates. His point is that an SDR image with lower dynamic range would show more pixels in the shadows, and draw the eye toward the director’s point of interest. Routhier then used sports television production as another example of when HDR can fall short. “Shooting outdoors you have little control over the lighting because of sun and clouds,” he said. 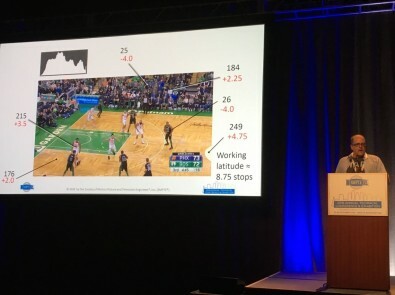 “But indoor sports like basketball are ideal to analyze for HDR. The playing field is very reflective, the playing field is not too large, so you get rich and dynamic compositions." The basketball court is made for HDR. Click to enlarge. He used an image of Clint Eastwood from Sergio Leone’s “The Good, the Bad and the Ugly”, photographed by Tonino Delli Colli. 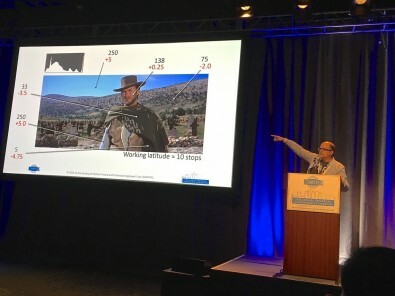 Delli Colli didn't even use the full 15 stops of his 35mm 2-perf Techniscope film to capture this famous image of Clint Eastwood from the film, "The Good, the Bad and the Ugly.” Click to enlarge.